Looking for information about the climate in Rome Italy? Here you will find the average high and low temperatures (in Celsius and Fahrenheit) for each month of the year, together with how much rainfall to expect for your visit to this incredible city. And a detailed Rome weather forecast for this the capital of the Kingdom of Italy and site of the Vatican City. The Fontana di Trevi in Roma by checcastef. Situated in the central-western portion of the Italian Peninsula, on the Tiber river and within the Lazio region of Italy, Rome experiences a Mediterranean climate typical of that of the coast of Italy. The best time to visit for warm weather that will not exhaust you during your sightseeing is from April through to the end of June and then September to the end of October. As in Maremma from where I am writing this a short distance north along the coast, and in other parts of Tuscany, October days - "the Roman ottobrate" - can be gloriously sunny and warm with wonderful pink and orange light in the late afternoons. Be aware, the August heat can exceed 32 °C (90 °F). The average high temperature in December is about 13 °C (55 °F), but in warmer weeks it can be higher. But be prepared if you are planning a winter city break, as sub-zero temperatures are also not uncommon: take a warm jacket just in case! Although snow through December, January and February has to date been rare in the city - in the last 24 years (from 1986 to 2010) it only fell four times and without laying - this February saw the streets of Rome and her monuments covered in snowfall. A wonderful site but with much accompanying confusion, Italian style! probability of thunderstorms, rain and snow - yes, it can snow in Rome! ...go to the Weather Rome Italy page. All of the best rated holiday accommodation in Rome Italy on one page: the reviews of thousands of bed and breakfast accommodations, hotels, apartments and vacation rentals from best to worst. 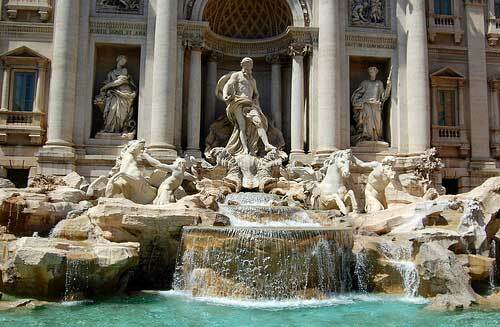 The photograph above of the Fontana di Trevi in Roma in Lazio is by kind permission of checcastef. Read a 10 day weather report or a 15 day weather forecast for anywhere in Italy.